A few weeks ago JAT Airways, the national airline of Serbia and previously of Yugoslavia, rebranded itself as Air Serbia. The move is linked to a large investment by the United Arab Emirates' Etihad Airways. The new partnership promises to significantly expand Air Serbia's fleet and route network, increasing Belgrade's importance as a hub for travel in Southeast Europe. The impact of the changes can already be seen in the winter 2013/2014 timetable which contains several new routes. Of particular interest to travellers in the Balkans is the expansion of short-haul flights within the region. New routes have been launched to Bucharest, Ljubljana, and Banja Luka, to be followed by Sofia and Varna in spring 2014. There will also be more frequent services on the existing routes to Istanbul, Athens, and Thessaloniki. For a lot more information about Air Serbia and other airlines in the region, head to Ex-Yu Aviation News. In a previous post I mentioned the BalkanViator website, which provides online timetables for bus routes in Southeast Europe, as well as information about taxi services and car pooling. Now the team behind Balkanviator are planning to add the ability to book bus journeys online. This is an ambitious goal, due among other things to the vast number of bus companies operating in the region. They have launched a crowdfunding campaign to raise money to fund the software development and other costs involved. If you want to know more, click through to the Indiegogo site below. Those of us who enjoy both travelling by train and travelling in Southeast Europe are used to bad news, but even so the introduction of new timetables in December 2012 has come as something of a shock. There have been drastic cuts in international services in the northwest Balkans, due mainly to a decision by Croatian Railways to abandon more than half of its international routes on economic grounds. As well as trains originating in Croatia this also affects lines passing through the country, with services to Bosnia particularly badly affected. Combined with previous developments such as the withdrawal of all international trains from Greece and the decline in cross-border connections between Italy and Slovenia, it seems that travelling by train in the Western Balkans becomes ever more impractical. For those readers who still want to try it, I have listed below all the remaining international trains from Bosnia and Croatia. This refers to the current winter timetable; there may be some additional services in summer. Bosnia has been left with just two international services. There is one daytime train from Zagreb to Sarajevo. The overnight train on this route is withdrawn, as is the extension from Sarajevo to Ploče, at least during the winter. One train daily will run from Sarajevo to Ploče, leaving in the morning and returning in the evening. It appears this is currently the only train running on the scenic Sarajevo to Mostar line. The useful services from Sarajevo to Budapest and to Belgrade have sadly disappeared after just a few years in the schedules. - Ploče-Mostar-Sarajevo (one daily, see above). There have also been changes to the domestic timetable, with the earlier of the two daytime trains on the Zagreb-Split route cut back to a Friday-to-Sunday service. Serbia has also been badly hit by the changes in Croatia. As noted above, there is no longer a train to Sarajevo, and connections to Zagreb and points further west have been severally reduced. Only the Belgrade-Zurich service will now cross the Croatia/Serbia border. In a separate development one Belgrade-Budapest train has been withdrawn, leaving just one daytime and one night service on this route. Slovenia's connections to Croatia haven't suffered too badly thanks to its position on various routes from Zagreb to Western Europe (listed above). The direct "Citadella" service to Budapest has been suspended - it seems this may be due to work on the line so perhaps it will reappear in the future. The only direct route to Budapest is now via through carriages that will join the Zagreb-Budapest train at Zagreb. This route is so slow that it is theoretically faster to travel via Austria, although this would involve at least two changes of train. 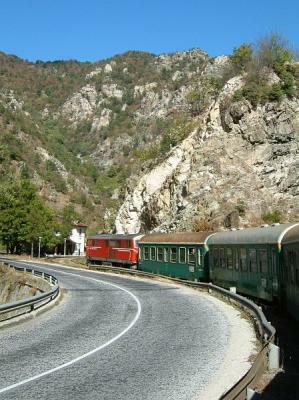 Regular readers of Balkanology will know that one of my favourite train journeys in the Balkans is the narrow-gauge line that meanders between the Rhodope, Rila, and Pirin mountain ranges of southwest Bulgaria - see the page on scenic train Journeys in the Balkans for more details. I'm certainly not the only fan of the railway from Septemvri to Bansko and Dobrinishte. A recent edition of the Hidden Europe newsletter has an evocative account of the trip. It sounds like the red engine and four green carriages are the same ones I travelled on almost ten years ago ... which reminds me, I really must try to get back there some day soon.